The realm of the flower kingdom and all of its nature beings hold new healing frequencies for the Golden Age. Flower Grace brings this light information into your energy system, starting at the causal body, to grant healing of old wounds and to bring transformation of old structures. Gentle yet powerful, this light penetrates all layers and reminds you that you are carried in the creation cycles of light. 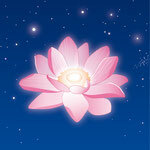 Flower Grace helps you to align with your own light and to invite it into your life. Your own completeness and the support of the flower kingdom can be experienced. Apply one drop on your lotus chakra, the bridge of your feet and on the front and the back of your heart chakra. Drop one drop with your arm stretched out in front of you, to your right side, behind you and to your left side. Place the bottle between your feet and stand in this energy field of Flower Grace until the energy has flown through completely. Hold the essence with your arm stretched out in front of your base chakra, then slowly lead it towards your base chakra. Do the same for all the other chakras (sacral chakra up to lotus chakra). Apply 2 drops between your thumb and index finger of both hands, then hold thumb and index finger of your left hand on your tailbone and thumb and index finger of your right hand at the back of your head until the energy has flown through the entire light channel of the spine. Rub 3 drops between your palms, place your hands on your kidneys until the energy has been absorbed, then lead your hands to the front on liver and spleen. Hold them there until the energy has been taken in completely. Finally take one drop under the tongue or diluted in a glass of water. Right here is the right website for anyone who really wants to understand this topic. You realize so much its almost hard to argue with you (not that I personally would want to�HaHa). You certainly put a fresh spin on a subject that's been written about for ages. Wonderful stuff, just wonderful! Thanks for one's marvelous posting! I seriously enjoyed reading it, you may be a great author. I will ensure that I bookmark your blog and definitely will come back someday. I want to encourage one to continue your great writing, have a nice holiday weekend! May I just say what a comfort to find a person that actually knows what they're discussing on the net. You certainly know how to bring a problem to light and make it important. More people have to read this and understand this side of your story. I was surprised that you are not more popular given that you certainly have the gift. You really make it appear so easy along with your presentation however I find this topic to be really one thing which I feel I'd by no means understand. It kind of feels too complex and very huge for me. I am having a look forward to your next post, I will attempt to get the cling of it!